A prospective customer is looking at the iMotorsports website, which features hundreds of pre-owned motorcycles and a selection of new ones. He has zoomed in on one motorcycle and is watching a video of the bike. The motorcycle is shown from every angle, although it is not shown running. If the customer decides to buy the bike, all details, including financing, are dealt with over the phone and internet, and delivery is free. The customer gets 24 hours and 50 miles to decide whether or not to keep the machine. Is this any way to sell a motorcycle? The success of iMotorsports argues yes. Haider Saba and Tim Walter started their business a few years ago with a small loan. “I was the first employee by appointment,” jokes Haider. Intensive and intelligent marketing got the startup off and running, and today, iMotorsports is a major player in the secondhand market. iMotorsports also rents Polaris Spyders and Slingshots from its Illinois location and offers a full range of Slingshot customization options. One feature of the rental operation is a “rent to buy” option: if a customer decides to buy a Spyder or Slingshot, the rental fees are deducted from the purchase price. iMotorsports attributes its success to four features: a good business plan, excellent marketing, superb customer service and training and retention of good employees. The iMotorsport business plan is to market motorcycles nationwide, using a combination of marketing strategies to acquaint likely customers with their offerings, both pre-owned and new. To convince customers that their mail-order purchase will not go sour, iMotorsports offers several separate warranties, geared to both provide real benefit to the customer and lessen the likelihood of exposure to the business. First, the company will take back any bike, no questions asked and at no cost to the customer within 24 hours. Second, there is a seven-day “fender to fender” warranty: if anything goes wrong during that time period, iMotorsports will pay to have it fixed. Motorcycles do not leave the warehouse without a careful inspection, so that the chances of something going wrong during this time period are slim. Third, there is a 30-day powertrain warranty. These warranties, coupled with free delivery and excellent customer ratings, ensure consumer confidence. Once a potential customer makes contact, customer service is key to making the deal. “There is zero excuse for bad customer service.” Haider points out that reviews on Yelp and Google can make or break a business. “Customer service is free.” iMotorsports posts a large selection of reviews on its website. Customers state that they appreciate that they are dealing with fellow riders. Employees are praised for going the extra mile for a customer, being patient, friendly and easy to talk to. 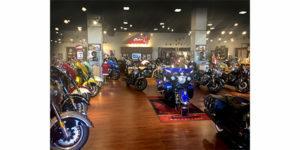 The common themes that customers mention in their reviews are that the buying experience was enjoyable, the selection of motorcycles was large and that employees took care of the customer. Very few reviewing customers mention price point although those who do, state that iMotorsports has relatively low price points. The most common item mentioned is a hassle-free buying experience. In order to have employees give excellent customer service, a dealership has to have good employees. Haider states that retaining good employees can be a challenge. “The income level is not there. A good salesman or mechanic can make a lot more at a car dealership. What I try to offer, instead, is good quality of life and an enjoyable work environment. We pay our salesmen a flat fee per sale, so there is no pressure to move a customer to a more expensive motorcycle. The salesman can concentrate on the best bike for that customer. We don’t fire salesman if they have a bad week. An excellent website is, of course, essential for an internet-based business. iMotorsports’ is targeted to its search function and sales of new and used motorcycles. The business website is uncomplicated and set up so that it is easy for the prospective used-bike customer to find the information they need. iMotorsports also has a presence on Facebook, but the purpose of the Facebook page is largely to provide a forum for reviews. 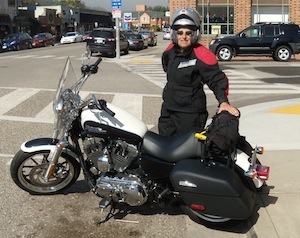 Haider believes that the motorcycle industry is changing, and dealers must adapt to the times. The iMotorsports concept of nationwide internet sales, backed up by excellent customer service, has proven itself. Haider is looking forward to expanding to more brick-and-mortar locations in 2018.